Crowley Maritime Corp. today christened the first of four new Jones Act product tankers at the Tampa Cruise Terminal. The 50,000 dead-weight-tons (dwt), 330,000-barrel-capacity ship Ohio is the first tanker ever to receive the American Bureau of Shipping’s (ABS) LNG-Ready Level 1 approval, meaning Crowley has the option to convert the tanker to liquefied natural gas (LNG) propulsion in the future. 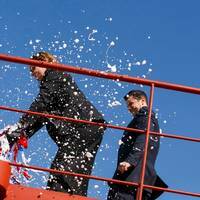 More than 100 guests watched as Pamela Beall, president of MPLX, a Marathon Petroleum Corporation subsidiary, broke a ceremonial bottle of champagne across the hull to christen the vessel. Crowley Maritime Corp. took delivery of Ohio, the first of four new, Jones Act, product tankers this week from Aker Philadelphia Shipyard, Inc. (APSI), the wholly-owned U.S. subsidiary of Aker Philadelphia Shipyard ASA. The delivery is momentous not only for Crowley, but also for the industry because it signifies the first time a product tanker has been constructed with consideration for the future use of LNG for propulsion. The remaining three product tankers being built by APSI for Crowley are currently under construction and have planned deliveries through 2016. Aker ASA has on 30 September 2015 transferred its equity holdings in Converto Capital Fund AS to Aker Capital AS, a wholly-owned subsidiary of Aker. As per 30 September 2015, Converto Capital Fund AS directly held 7,237,631 of the issued shares and votes in Aker Philadelphia Shipyard ASA, or 57.56 per cent of the share capital. Aker Philadelphia Shipyard ASA announced today that its Chief Financial Officer, Jeffrey Theisen, is resigning from his position later this month to pursue other career opportunities outside of shipbuilding and shipping. Art Whittemore, who was previously CFO of Gamesa USA, a manufacturer of wind turbines, is currently serving as interim CFO of AKPS to ensure a smooth transition while a permanent successor is identified. Aker Philadelphia Shipyard ASA informed that its wholly-owned U.S. subsidiary, Aker Philadelphia Shipyard, Inc. (APSI), has executed definitive documentation with PIDC Regional Center, LP XXXI for a secured term loan of up to USD 60 million. The loan has a five-year term and a fixed interest rate of 2.75% through maturity. The loan is secured by a lien on the company's interests in Hulls 021-024, which are the four product tankers to be included in the AKPS-Crowley joint venture. The company made its first draw under the facility on the closing date. The loan is made through the Welcome Fund (EB-5) loan program, a source of low-interest senior financing for large-scale, job-creating projects undertaken by strong governmental, corporate or institutional sponsors. The joint venture between Aker Philadelphia Shipyard ASA (AKPS) and Crowley has received a firm and fully underwritten commitment from a group of banks and other financial institutions for a USD 325 million senior secured term loan facility. According to AKPS this facility will be used for post-delivery financing of the four product tankers to be included in the AKPS-Crowley joint venture (Hulls 021-024). This commitment is subject to the execution and delivery of definitive documentation and satisfaction of customary conditions precedent. Aker Philadelphia Shipyard, Inc. (APSI), the sole operating subsidiary of Aker Philadelphia Shipyard ASA, announced today that a new four year collective bargaining agreement has been ratified by the Philadelphia Metal Trades Council (PMTC). The PMTC is the exclusive bargaining representative for production and maintenance employees at APSI and consists of ten unions. Mike Giantomaso, Aker Philadelphia Shipyard Vice President of Human Resources remarked, "We are pleased to have successfully ratified this agreement and are very proud to continue our partnership with the PMTC. Aker Philadelphia Shipyard ASA (the "Company") (Oslo: AKPS) has on 21 July 2014 purchased 2,155 shares in the Company on Oslo Axess at an average price of NOK 160.64 per share with a total consideration of NOK 346,190. Following the transaction, AKPS holds a total of 2,155 own shares, constituting approximately 0.02% of the Company's shares and votes. Reference is made to the stock exchange notice of 17 July 2014 where AKPS announced a buyback program for up to 10% of the Company's share capital. 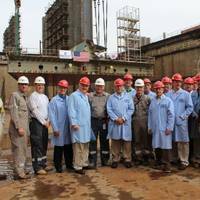 The Board of Directors of Aker Philadelphia Shipyard ASA has resolved to initiate a buyback program for up to 10% of the Company's share capital. The decision reflects the Company's focus on maximizing shareholder returns over time, its strong financial position, its confidence in its ability to deliver on its operational commitments, and a reflection of the opportunities it sees to further develop its shipping investments. The buyback program will be continuously evaluated to maximize its value to the Company's shareholders, including price at which buybacks are executed. Following the announcement of 10 June 2014 by Aker Philadelphia Shipyard ASA (AKPS) Philly Tankers had successfully secured equity commitments necessary to finance the purchase of two product tankers from AKPS with deliveries in 2016 and 2017. As planned, the conditions precedent to the closing of the Transaction, including the execution and delivery of satisfactory definitive documentation and the approval by the general meeting of American Shipping Company of its participation in the Transaction, have been satisfied and the Transaction is now closed.